The Sound of Your Life is the number one entertainment provider in Central South Africa. Offering an unrivaled listening experience with a mix of music, news and entertainment, OFM serves the influential SEM 7 – 10 market. 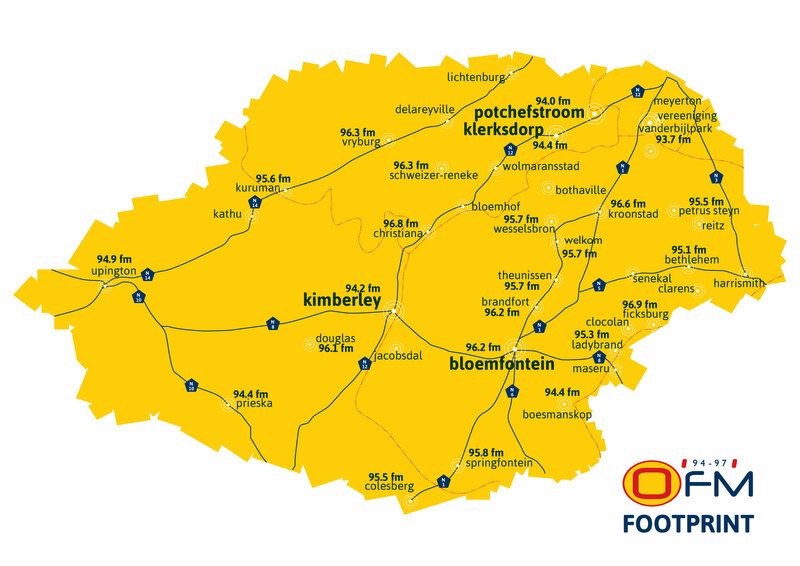 Focusing on lifestyle across the Free State, southern Gauteng, Northern Cape and North West, OFM is a brand that is synonymous with the people of Central South Africa. From the radio in the kitchen, to the car and the one at the office, OFM speaks to people during the various stages of their day, supplying information and influencing decision makers with a unique listening experience. The OFM audience is incredibly loyal, interactive and passionate about “The Sound of Your Life” and OFM enjoys one the highest instances of time spent listening to the radio in South Africa. With a unique connection to the audience OFM is not only a radio station but a well-trusted friend. Our Sales team is ready to consult your business on the best possible advertising and business solutions for your specific and unique business needs. For a free quotation or any questions, contact any of our professional Sales Account Executives.